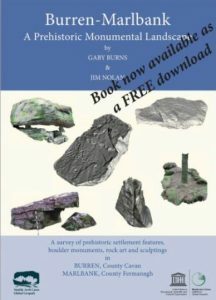 Rock Sculptings – an entirely new category of Rock Art as yet unknown to all but a few archaeologists. One of the big problems in identifying Rock Sculpting is the natural look that these features tend to have. Rock Sculptings are distinguished from ‘cup and ring marks’ in that the latter tend to be regular shapes superimposed on the rock face whereas the former is excavated from the natural aspects of the boulder. However in many cases they occur on ‘fresh faces’ exposed after slab removal which often provides us with conclusive evidence of their anthropogenic origins. It is from these many Evidence Boulders that the five main sculpting features can be established. Rim grooving is where a worked edge occurs – usually on the top of a boulder with a relatively level top and a vertical face. Hollows. Archaeologists, and even geologists, will usually assume hollows to be natural. Sculpting hollows can be shown to be anthropogenic by use of geological evidence, comparisons with adjacent known examples and context. They are most easily identified when in the context of other sculpting features and particularly when they are found on ortho-quartzite sandstone which excludes any erosion origins. How do we distinguish cups from hollows? Cups tend to be circular and almost hemispherical whereas hollows tend to have an irregular outline and variable depths. Note: The carved rim edges – see Rims/Ridges below. Sculpting channels can often be found emanating from corner hollows, they tend to look natural but on the local sandstones here they cannot have formed by water flow erosion. It is likely that they are deliberately representing natural channels but can be shown to be in fact unnatural. These are best considered together as they tend to occur together, often on apex corners of sculpted boulders. They are also the most obvious anthropogenic sculpting features. To create these relief features a considerable amount of rock has had to be removed using a stone hammer. Quite often considerable additional work may have been done on the boulder rims/ridges. Peaks and notches can be validated as a type as they occur on numerous evidence boulders. These are the most subtle of the sculpting features yet they are the best validated as most of the Evidence Boulders display these features. The best examples occur on ‘split’ Evidence Boulders as the sharp edges of the unworked sides contrast strongly with the sculpted rounded rims often created with grooves around the rim. A Ridge is where there is an almost equal slope on both side of the edge. Examples of rims can be seen in most of the hollows and channels examples above.